'Fireworks' Ornamental Pepper planted en masse along a garden walkway. Grab a pencil and paper, my darlings, you are going to want to write some things down. 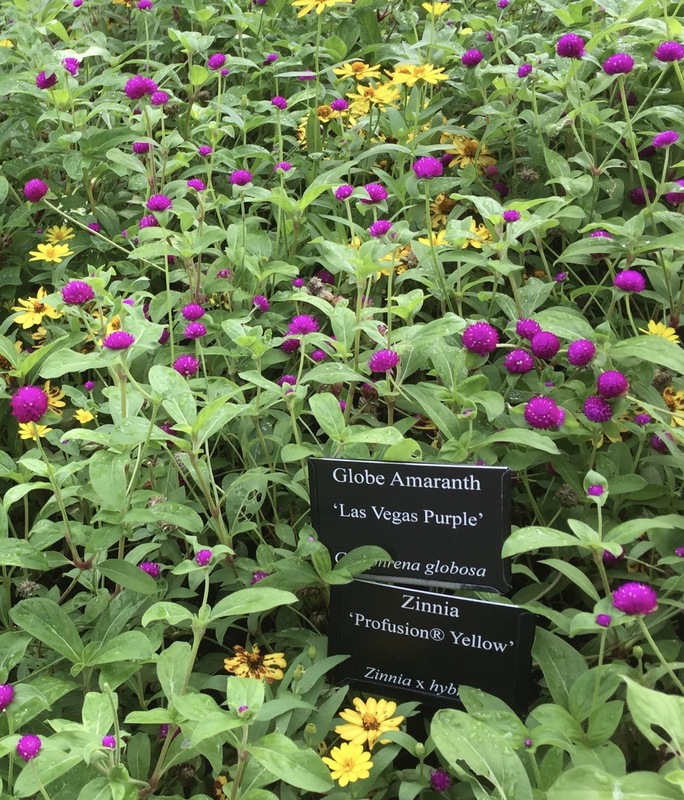 Namely, the five heat-loving, humidity tolerant, wildly colorful annuals I saw on display at the Dallas Arboretum and Botanical Gardens this weekend. Despite the steamy heat and lack of time to explore the entire 66 acres of this fabulous place, I certainly covered enough territory to see what annuals they were relying on for their 2016 parade of summer seasonal color. You may be surprised, as was I, as to what they included.....and perhaps as notably, what they did not. So here goes: 5 Colorful Annuals that can really take the heat. AAS Winner 'NuMex Easter' Ornamental Pepper. Find seed here. Ornamental peppers were everywhere providing effective masses of color that were muy caliente, matching the July temperatures in Dallas. But there intense red, purple and yellow hues were unphased by the heat and humidity. Bushy, neat and tidy, requiring absolutely no effort to look their best. I know this because I grew NuMexEaster, an AAS winner last year and it truly did win the prize in my garden. I could kick myself for not starting it earlier this year. For it made a nice bushy edging plant along my brick border through late summer and well into fall. These will be no.1 on my list for fall garden color when they reappear in nurseries this fall. 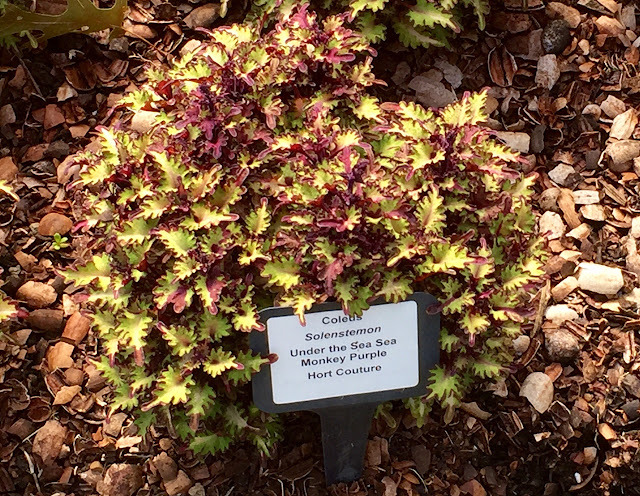 A small leaved gold and purple tipped coleus with a fun name. 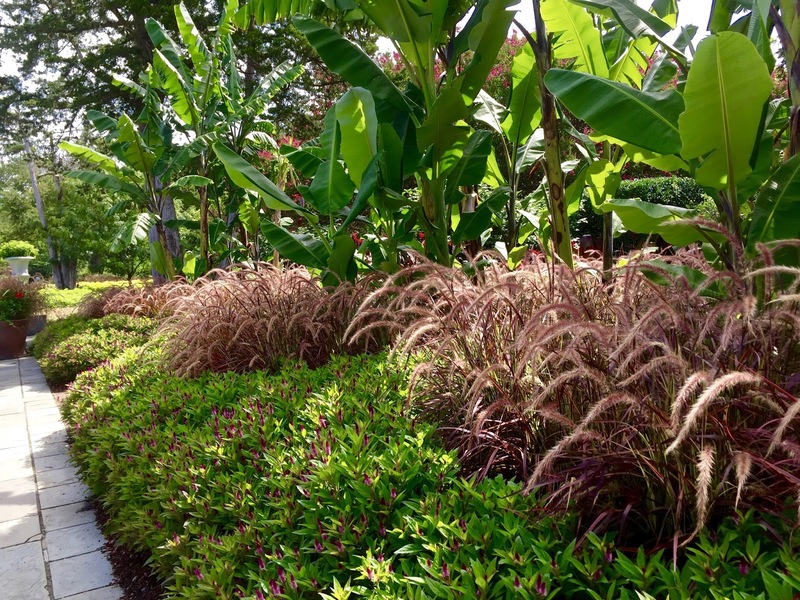 Coleus too was everywhere, planted in broad sweeps, typically in the foreground of taller growers like cannas, ornamental grasses, banana and all variety of elephant ears. A play of broad and fine leaved textures that certainly pleased this passer by. Again, a case of bushy, tidy plant varieties that keep their neat appearance and strong form when planted in abundance. Ruffly edges and a broad range of colors make them valuable in the summer border. Fine textured, purple feather grasses soften the rigid and dramatic broad leaved specimens behind. Celosia is in the foreground. 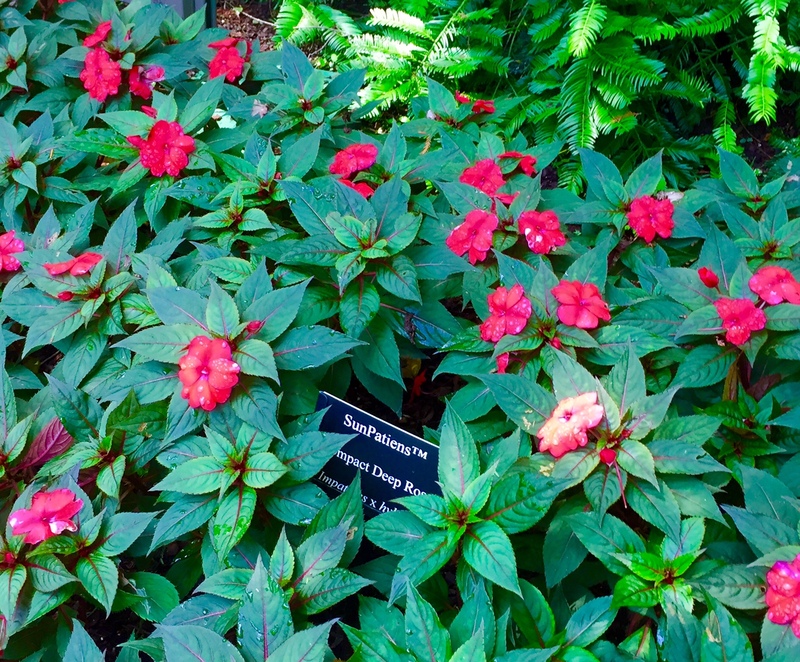 Okay, call me a doubter, but I have always been skeptical that sunpatiens could really, well, handle all that sun. But there presence here in huge sweeps and swoops and drop dead color proved me wrong. Another plus for this drama queen.....notice in the image below how it transitions from sun into shade while maintaining a consistent degree of bloom and happy appearance. 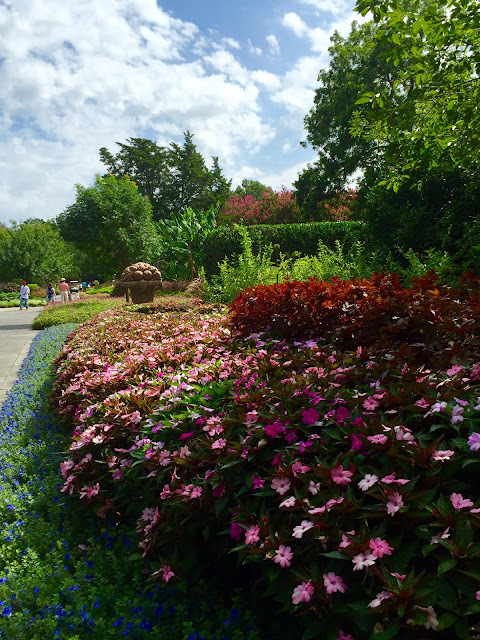 Huge border of pink and purple sunpatiens with blue daze in the foreground. I LOVE this old fashioned, round and cheery purple bloomer! And look how dear it is planted with yellow profusion zinnias for a little explosion of garden happiness. Methinks it is too sweet to be named Las Vegas Purple (find it at Park Seed here) but as this variety is supposed to be more heat tolerant, I will not quibble. Plant purple gomphrena with yellow profusion zinnias to charming effect. 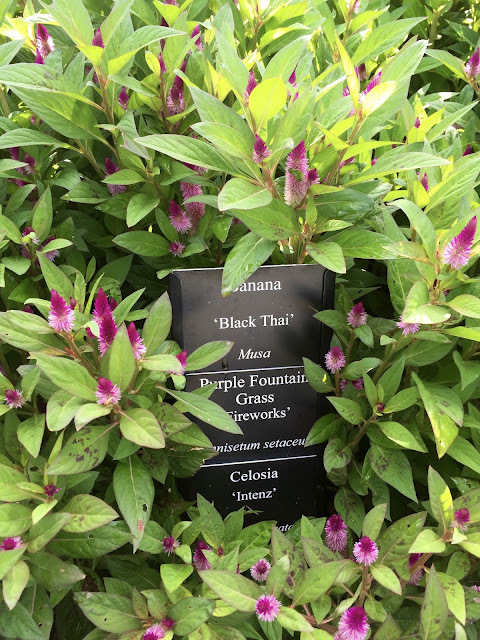 I don't think celosia is what automatically comes to mind when we think of bedding plants for summer color, but it definitely fits the bill here, where it is used in dramatic profusion...particularly the variety 'Black Thai', a dainty, bi-colored pinky-purple that is quite dear. 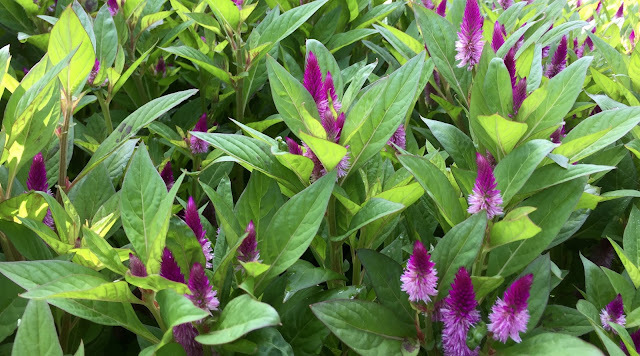 For a variety of old-fashioned heirloom celosia, visit Baker Creek Heirloom Seeds. 'Broad Sweep of the dainty 'Black Thai' celosia fronts blooming "Fireworks' Fountain Grass. What I find really interesting in these selections is this......they are all bushy, largely self-cleaning without a lot of dead-heading required, and do not trail or cascade. I did not see one petunia, angelonia, scaveola, ice plant or moss rose anywhere. No cushion begonias (though there were MANY angel wing begonias that I failed to put in the top 5) or well, I could go on, but you get the drift. Easy care, heat and drought tolerant, and excellent performance. What's not to love? If you have a chance to visit this very special place, do so! It is glorious, magical and miraculous in the spring and fall. For a list of summer activities, go to Summer at the Arboretum. You might also want to check out ARCHITECTURAL DIGEST'S 15 Breathtaking Botanical Gardens To Visit This Season here.